For any business there is a point at which the revenue reaches a level such that the gross margin made from selling the product is equal to the operating expenses, at this point the business has a net income of zero, and is said to be at its break even point. In most businesses, after a period of time, the gross margin percentage will stabilize and remain fairly constant. An understanding of the idea of break even will lead owners and managers to believe that they know the level of revenue required to break even and anything above that must be profit. The conclusion is, the faster they grow and the bigger they get, the more profit they must be making. 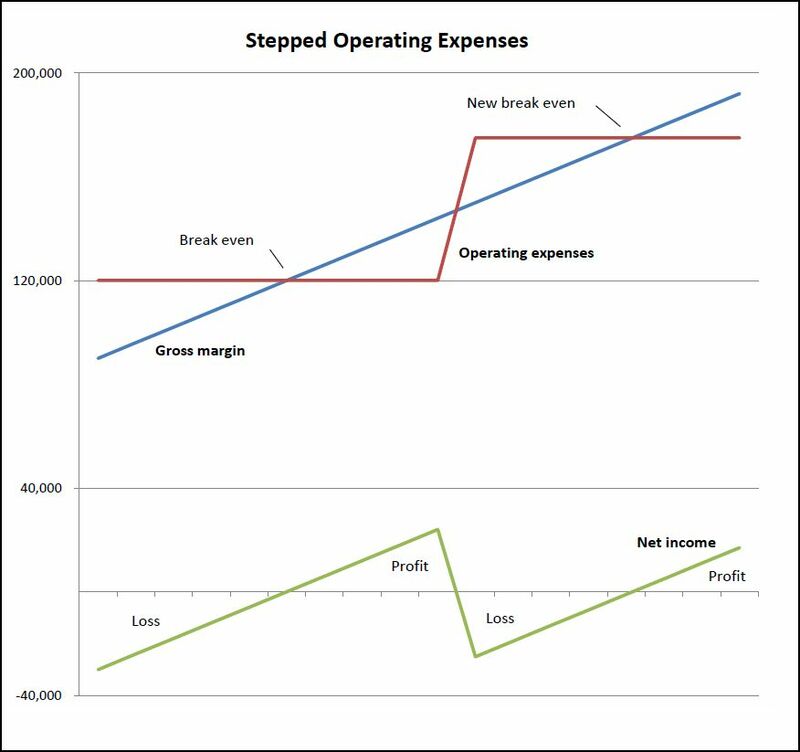 Unfortunately, this is not the case, a quick look at the formula above shows that the break even revenue also depends on the operating expenses. As a business grows operating expenses do not remain constant, and worse than that they do not grow at a steady pace, they grow in steps. Consider for example the income statement of the following business operating in a small rented premises with one administration person. The gross margin percentage is 45% (54,000/120,000), and the operating expenses are 45,000, we can calculate the break even point revenue using the formula above. The business will reach its break even point when the revenue is 100,000, and the gross margin on any revenue above that (20,000 x 45% = 9,000) is profit. However, suppose the business is currently trading at its peak capacity and in order to grow further needs to move to larger premises, and take on additional office staff. Operating expenses now increase to 60,000. The business is operating over its original break even point of 100,000 and should be making a profit. What has in fact happened is that the operating expenses have not increased gradually, but have jumped by 18,000. The break even point revenue has jumped from the original 100,000 to 140,000. Since the business still only has revenue of 120,000, it is operating below break even resulting in a loss of 9,000. Gradually with the improved facilities and new staff the business should expand and the revenue should grow above the new break even point, and the business will become profitable again. This cycle will continue to happen throughout the life of the business as shown in the chart below. The current operating expenses establish the break even point revenue. Revenue reaches the break even and gross margin is equal to operating expenses. …. and so on for the life of the business …..
For a small business the impact is more significant. For example, a one man business taking on an additional person will effectively double its administration expenses overnight, its break even point revenue will increase significantly, and what was a profitable business can become loss making until revenue can be increased back to the new break even. The conclusion is that if the idea is to expand the business and grow, then the business plan needs to be in place to enable it to jump from step to step in a controlled manner. Operating expenses should be held as low as possible for as long as possible to keep the break even revenue down. When profits have been maximized at that level of revenue, and further growth is not possible without a step increase in operating costs, then there should be a plan in place to show how the revenue can be rapidly increased to reach the new break even point as quickly as possible. It follows that if for whatever reason the new break even point revenue is not achievable, either because there is not sufficient demand for the product or competition makes it impossible to grab a larger share of the market, then it is better not to move to the next step, but to leave the business at its current size and maximize profits at that level. Maximize profits for the current level of revenue and operating expenses. Decide whether the new break even point revenue is achievable before expanding. If this is the maximum revenue and profit it can achieve, it now needs to consider expansion. It calculates that operating expenses will increase to 90,000 to enable new premises and staff to be taken on. At a 30% gross margin its new break even point revenue is 90,000/30% = 300,000. The revenue must double to accommodate the proposed increase in operating costs. The business must now decide whether such an increase is feasible taking into account demand for the product and competition and, if it is, what sales and marketing plans are necessary to achieve this rapid expansion. If the revenue expansion is not feasible, then the business should either remain where it is, maximizing profits at its current level of revenue, or consider less risky expansion plans. Our break even point calculator is available to help you calculate the break even point revenue for up to four different scenarios.